Trinity Grit — by Ben Letton, describes the late Harold "Bud" Jackson of Hayfork in many of Jackson's own words. 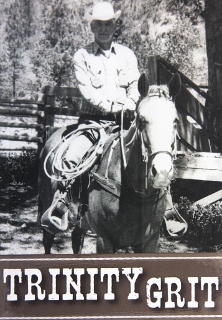 Jackson was a colorful Trinity County backwoodsman, rancher, miner, mule packer, and mountain lion hunter, as well as working occasionally as a special deputy for the Trinity County Sheriff's Department. With his trusty hounds, Jackson was the one who discovered the buried bodies from two murders in the Wildwood area, the body of Ray Latham in 1948 and the body of Stephanie Bryan in 1955, the latter including national media coverage for many months. Ben Letton, a Trinity County native who now lives in Redding, grew up as a close friend of Bud Jackson, spending a week or more at Bud's ranch during summers since Letton was five years old. In later years, Letton conducted oral interviews with Jackson, resulting in a 115-page typed transcript which provided much of the content for the book. 2014. Paperback, 183 pages. 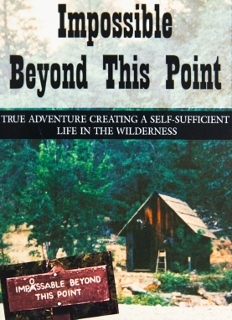 Impossible Beyond This Point, True Adventure Creating a Self-Sufficient Life in the Wilderness — by Virgil, Marcella, and Joel Horn, relates the true story of a couple with three young boys who set up a home in the rugged Trinity Alps Wilderness area, far away from any modern conveniences, beginning in 1967. They came from the Sylmar area of southern Californa and located themselves on a mining claim along the North Fork of the Trinity River. They built their life there, often overcoming great odds, including having all their winter supplies one year destroyed by a bear. Virgil obtained a teaching certificate for teaching two terms at another location in Trinity County, and then taught his three sons at home for the rest of their school years. The family cultivated a large vegetable garden, mined placer gold, and sold unique jewelry created from their gold. In the mid-1990s, they successfully patented their mining claim. 2014. Paperback, 371 pages. 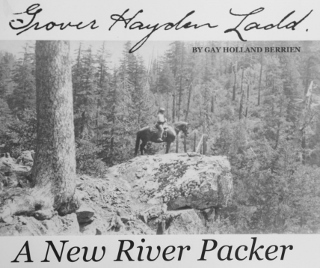 Grover Hayden Ladd, A New River Packer — Gay Holland Berrien, describes Grover Ladd of New River, his family and friends, and the Ladd pack train. It includes histories and biographies relating to placer and hardrock mining, the local Forest Service, fish and game activities, weather events, the school system, and the Denny family of Siskiyou County. Ladd's family came to the headwaters of New River during the hardrock mining boom of the early 1880s, but over time acquired a store and post office, and eventually homesteaded a ranch downstream at the present location of Denny. The book includes many of the Ladd family photographs which are archived at the Jake Jackson Museum in Weaverville, and is a sequel to Dr. Valerie Budig-Markin's 2004 book on Ladd's mother, Nellie E. Ladd, Mining Camp Photographer of the Trinity Alps, 1859-1922. The author is a Big Bar resident who for many years lived at Denny and knew Ladd. 2014. 200 photographs, paperback, 8½ x 10½ inches landscape, 245 pages. NOTE: Copies and enlargements of the photographs shown in this book can be obtained through the Jake Jackson Museum History Center, (530) 623-5211. Photo Essay of Trinity County — by Diane Kathleen and Susan Sheppard, brings to life, in pictures, all parts of historic Trinity County, from the Native American heritage to the variety of miners, farmers, store keepers, pack train operators, loggers, and others, all of whom lived colorful lives here. Over 230 photographs, most printed here for the first time, are accompanied with informative captions and written historical descriptions of Trinity's different mountain communities. 2011. Paperback, 128 pages. Trinity County Historic Sites — edited by Alice Goen Jones, is the most comprehensive resource for historical sites and places in Trinity County, and recommended to anyone with an interest in Trinity County. The result of extended research put together by a wide variety of local historians and Trinity County residents, this beautiful book is illustrated with over 260 historic photographs, and includes maps and a detailed index. 1981. Hardbound, 422 pages. Tales of the Mountaineer — by John Jacob "Jake" Jackson, is an action-packed collection of tales Jake Jackson wrote over several years for the Rotary Club of Weaverville's weekly bulletin, The Mountaineer. Born and raised in Trinity County, Jackson took a deep interest in the county's history, was instrumental in starting the present Trinity County Historical Society (and its Jake Jackson Memorial Museum on Weaverville's Main Street) and in his later years was considered the foremost Trinity County historian. Much of the history he gathered is included in the stories in this book. 1964. Paperback, 179 pages. From the Known to the Unknown — relates the very unique experience and observations of a French aristocrat, Baroness de La Grange, during her stay at a large hydraulic mining operation in 1892 to 1894, in Trinity County. The book is a transcription of her letters back home, telling her correspondents about the rugged life and interesting people around her. The La Grange Mine at one time was the largest hydraulic mine in the world. 2000. Paperback, 122 pages. Flowers and Trees of the Trinity Alps, a Photographic Guide — by Alice Goen Jones, displays colorful and detailed photographs of trees, flowers, and shrubs within and adjacent to the Trinity Alps Wilderness Area of Trinity County. All 332 color photos were taken by Jones during her decades of hiking within this geographic area. Her book very popular for identification of Trinity's plants and flowers, the late Mrs. Jones was one of the first women to receive a degree in forestry, and held a great interest in botany as well as Trinity County history. Jones served as a president and board member for the Trinity County Historical Society for many years, rating a plaque with her name on the front of the Jake Jackson Museum; the museum's history research center is named after her. 1986. Paperback, spiral binding, glossary and detailed index, 195 pages. Trinity Yearbooks — Yearly publication of Trinity County history covering various subjects. [Index...] Get them separately at the Museum Gift Shop for $6.00 each. (Some years are 50% off: 1967 & 1968, 1971 & 1973, 1975, 1976, 1977 & 2002.) Or buy the complete set, 1955-2013, online. Tales of the Trinity —edited by Dewey and Nola Mosier, presents writings of Major Horace Bell on his adventures in the Trinity County mining camps in the early 1850s. The articles were first printed in a weekly literary magazine, The Golden Era, in 1879 and 1880. 1983. Paperback, indexed, 55 pages. 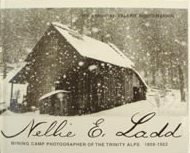 Nellie E. Ladd - Mining Camp Photographer of the Trinity Alps 1859-1922 — by Valerie Budig-Markin, brings to light the life and photography of a woman who lived in the New River watershed of Trinity County from 1886 until her death in 1922. Nellie Ladd took photographs and developed them herself in the isolated and very remote locale of Old Denny. Budig-Markin shows the photos and chronicles many of the stories behind them, including Nellie and her family, the life of the hardrock miners and the other people living in the area that was only accessed by foot or horse. Also included are biographies on some of the area's later residents plus some of the historical field research that was conducted in partnership with the Trinity County Historical Society. Over 200 photographs. 2004. Both paperback and hardbound, 8½ x 10½ inches landscape, 189 pages. Traveling the Trinity Highway — edited by Ben Bennion and Jerry Rohde, describes historic life along the present route of the scenic Highway 299 West from Redding in Shasta County to the Humboldt County Coast, passing through Trinity County. The book provides fascinating - and often funny - histories of the various communities along the way, supported by many photos. Over 100 photographs and many maps and other illustrations. 2000. Paperback, 8 3/8" x 10 7/8" landscape, 246 pages. Moon Lee One: Life in Old Chinatown, Weaverville, CA — An archaeological study of the Chinese-American pioneers. (138 pages). Dear Mad'm — by Stella Patterson, is a real classic, laden with unexpected bits of humor about an 80-year-old woman who decides to live in a remote mining claim cabin along the Klamath River in the early 1950s. She has run-ins with rats and a mule, but develops a lasting friendship with her equally eccentric neighbors. Although the book does not bring out this part of her life, Stella lived in the Hawkins Bar area of Trinity County and taught school both there and in neighboring Humboldt County. She also knew the Ladds (see books about Nellie and Grover Ladd). Printed originally in 1956, this book continues to be very popular, and is one that first-time purchasers love so much, they buy more to give away as gifts. Dear Mad'm, Who Was She? 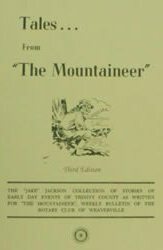 —by Peter and Elizabeth Lismer, covers the biography of Stella Patterson, author of Dear Mad'm, and includes several of Patterson's captivating short stories about mountain life. Peter Lismer is Patterson's great-nephew, who with his wife, Elizabeth "Liz", underwent several years of research to put together this book of Stella's life, from her early family life, attending Mills College, marrying a judge, and then remarrying a rancher in rugged northwest Trinity County. Naturegraph Publishers of Happy Camp receives many fan letters from admirers of Stella Patterson and Dear Mad'm. 2012. Paperback, 160 pages.